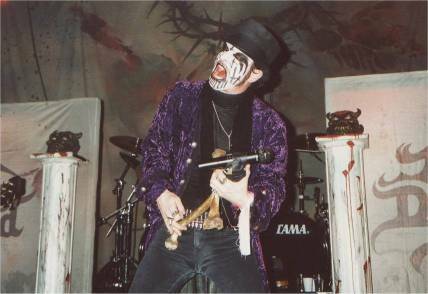 The past two months King Diamond has toured Europe. I saw the band about a month ago when they played at 013 in Tilburg, at which time King's voice was in a dreadful state (which didn't keep him from going all the way and doing all the encores, though). The day before that show, the band was supposed to play at De Kade in Zaandam, Netherlands, which in the end didn't happen because of the voice problems. The show was postponed until the 30th of April. De Kade is a nice and rather intimate venue. 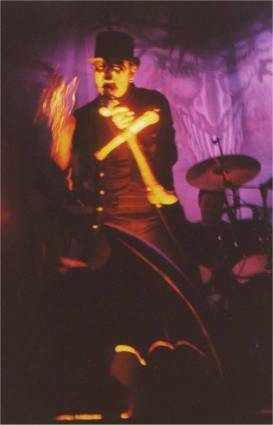 The stage is quite small, but just big enough for the usual King Diamond show elements to be used - including eye-catching actress Jodi who performed to enhance the story of various songs. The band - King, Andy LaRoque, Mike Wead, Hal Patino and Matt Thompson - played, as far as I can recall, the same set as at 013. This included the opener "Welcome Home", then (a.f.a.i.c.r.) "The Candle", "The Family Ghost", "The 7th Day of July 1777", "Abigail", "Sleepless Nights", "Eye of the Witch", "Voodoo" and several tracks from "House of God" ("Follow the Wolf", "House of God" and "Black Devil"). The final encore, of course, was "No Presents for Christmas". Unfortunately no Mercyful Fate stuff. The band clearly enjoyed the show, possibly because it was the final show on the tour. There was a lot of partying going on after the final song, including rather a lot of booze that didn't end up where it ought. King's voice was spot-on, which was quite a relief after the 013 experience (which had been atmospheric and cool, but voice-technically crap). This final show was a very enjoyable one.